Rissoles are such an easy old timey favourite dish. Sometimes you get bored of the same-old-same-old, and need to spice them up a bit. A while ago I posted my favourite lamb rissoles which always go down a treat. In our kitchen, we had some chicken mince, a few veggies and some Greek Yiros seasoning which were itching to be used, so I came up with a new spin on an old favourite. It was SO GOOD! I shouldn’t be surprised. Lately I’ve been just rolling chicken breasts in Greek Yiros seasoning and cooking them and they have been De.Licious. 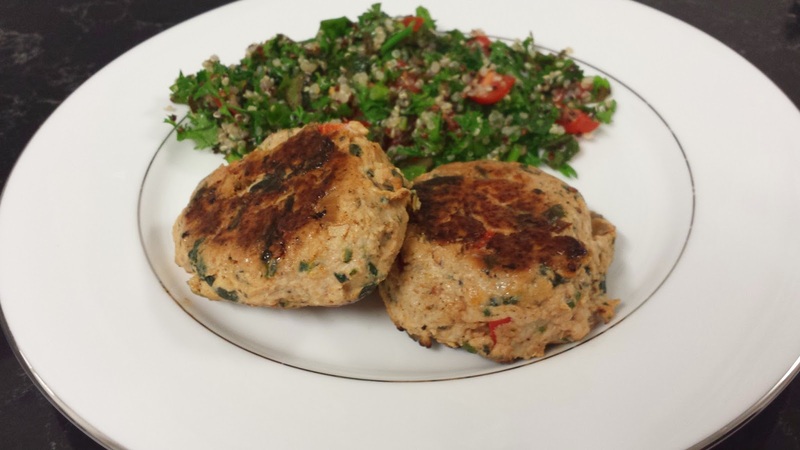 We served the rissoles with quinoa tabouleh because our parsley, mint and spring onions were ready for harvesting from our balcony garden, and it is one of my all time favourite sides. We made these rissoles earlier in the week without the feta and tomato paste, then immediately made it again with the additions once we finished the first batch. We loved the original recipe, but knew that those couple of additions would take it to the next level. Love. These. Rissoles. We will have them again! 3 tsp Greek Yiros seasoning (I used this which I picked up in my local IGA, but you could make your own using lemon rind, garlic, oregano and thyme, plus some sumac if you like). Add lemon rind to up the lemon element of the flavour profile – always so good in Greek dishes. Swap the breadcrumbs for quinoa flakes for a gluten free option. Make your own yiros seasoning, or just swap it out for any other seasoning mix you particularly enjoy. Portugese chicken seasoning could work, Mexican seasoning would be nice, or for a Middle Eastern flavour mix, try Karahi or Baharat. If you want to be really fancy, use a tbs of green or red curry paste (omit the feta cheese if you do this, and consider adding finely sliced kaffir lime leaves – ooh, planning a future Thai rissoles post in this spins section. Drool). Use up whatever veggies you have in the fridge to pad out the meal. Next time I will make a double batch because it is a great meal to reheat after work. Omit the feta if you are really trying to cut down on fat content, but I strongly recommend against it because a little goes a long way flavour-wise. A final spin – make meatballs instead of rissoles, and get creative with how you serve it. Adding a nice tzatziki could also be tasty with this meal. OK I could keep going but I’ll stop now. Its time to get to the fun part – cooking them! Get your hands in there and mix the ingredients! Top tip – pop on a couple of cheapie latex gloves when you do this – the kind that come in a big box from the supermarket. It will save you a lot of hand-cleaning grief later. You don’t need to over-mix it, just mix it enough for the ingredients to be fairly evenly distributed. Heat some rice bran oil in your frypan and fry on both sides over a medium heat until cooked through (approx 4 minutes a side, but slice into one with a knife to check that it is cooked through before serving). Serve with a side or on a burger. Delicious! As a new feature to this blog, I will be adding the nutritional breakdown for each recipe that I post. I thought it was a potentially useful addition to each post. One day I will get around to doing this retrospectively, but no promises that I’ll get around to it any time soon. We shall see. I can’t 100% guarantee that it will be perfect, because I use free online recipe calculators which don’t always have absolutely every ingredient/brand down pat. Sometimes I will have to choose a “close-enough” option, but it will always be pretty darn close or I’ll tell you in the post that I couldn’t find the ingredients in order to create a nutrition panel. Anyway this meal is high in protein, low in carbs and has an acceptable amount of fat. Its a healthy and yummy meal. ooh well done adding the nutritional info. That's a lot of effort! I love Tabouleh. I made it out of whatever, including green beans, at some point in the distant past when I bothered about food. I was telling T that we should make a whole lot of different vegetarian rissoles of different varieties and freeze them for quick food-nonce preparation. I request vege rissole varieties, please! Thanks – I'm glad you liked the nutrition pannel. I thought it was pretty cool and was something I often wish recipe blogs included. Tabouleh is just heaven on a plate, isn't it? I make long poop shaped options to use on wraps but they could just as easily be made rissole shaped, cooked, frozen and defrosted as needed. I shall investigate more options and make some more varieties too!